Jack Gallagher Interview with Bruce Duffie . . . . . . . . .
Gallagher’s works have been performed or recorded by the London Symphony, Virginia Symphony, Charleston Symphony, Cleveland Chamber Symphony, Polish Radio Symphony Orchestra of Krakow, Kiev Philharmonic, Koszalin Philharmonic Orchestra, Ruse Philharmonic Orchestra (Bulgaria), Utah Arts Festival Orchestra, U.S. Air Force Band of Flight, Cincinnati Conservatory Wind Ensemble, Indiana University Wind Ensemble, Grammy® award-winning pianist Angelin Chang, Trio Terzetto, and others. His compositions are included on fourteen published compact discs on the Naxos, Musical Heritage Society, Capstone, Vienna Modern Masters, Summit Records, Promuse, Altissimo, and ERM labels. Gallagher’s music has been broadcast over WNIB (Chicago), WGBH (Boston), KUSC (Los Angeles), KDFC (San Francisco), WFMT (Chicago), WCLV (Cleveland), WQXR (New York), WQED (Pittsburgh), WKCP (Miami), KING (Seattle), KUHA (Houston), WETA (Washington, D.C.), KHPR (Honolulu), KWUR (St. Louis), WGUC (Cincinnati), WKCP (Miami), Minnesota Public Radio, KPAC (San Antonio), KBPS (Portland, OR), KVOD (Denver), Classical 24, Radio New Zealand, and many other stations. His Berceuse, recorded by the Polish Radio Symphony Orchestra of Krakow conducted by Szymon Kawalla, has been broadcast 50 times over Radio Stephansdom Klassiksender, 107.3 FM, Vienna, Austria. 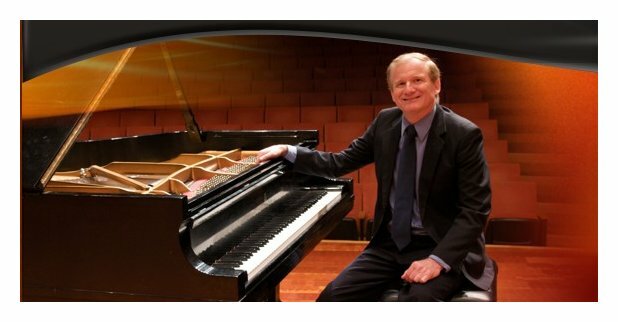 At Wooster he teaches Composition, Twentieth-Century Music Theory, Orchestration, and Seminar in Music of Living Composers, a course he originated. For additional information, visit jackgallaghermusic.com. 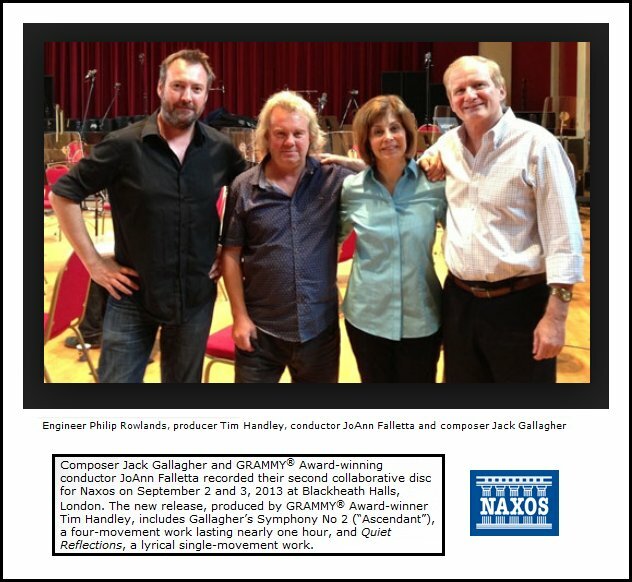 Like Sir Malcolm Arnold, Jack Gallagher is a trumpet player turned composer. I first heard his music after doing an interview with Donald Erb. One of the (LP!) recordings he sent me also had a piece by Gallagher, and I started investigating. Soon I found a couple more recorded items and also his contact information — which, in those ancient days before the internet, was much more of a nuisance all around. But we didn't know any better back then, and it was arranged that when he was traveling toward Chicago, he would stop for a conversation. He was very enthusiastic in his manners and ideas, and what you are about to read reflects this genuine eagerness to convey the joy and satisfaction he found in sound. Here is what was said that afternoon back in August of 1988 . . . . . . . . .
Bruce Duffie: You are both composer and a teacher. Do you get enough time in your schedule to do the composing that you want to do? Jack Gallagher: Few teachers that I know seem to get enough time to do the composing that they want. I’m fortunate because the school to which I’m attached — The College of Wooster in Ohio — has a very generous leave program, and one becomes eligible to apply for a Research Leave every fifth year at full pay. In fact, next year I’ll be going on full Research Leave, so in that respect the College has been very, very supportive and very generous. And of course there are the summers. But when School is in session, it’s very rough and difficult to work. BD: Are you ever frustrated that the ideas don’t come when you have the time, and they do when you’re busy? JG: They have to come even when I’m busy, because when the work is being done and there’s a commission and a deadline, one has to get it out one way or another. Usually what I find worse for me is when I try to teach my classes in the afternoon, and then put the kids to bed at night. I work until late, in the middle of the night if I can, and with afternoon classes I don’t have to get up very early. So when possible I try to compose in the evenings, but of course there’s paper grading and the inevitable preparations, and all the busy work as well. It’s hard to do it but I try to find a way. BD: Do you teach composition or theory, or other classes? JG: It’s a relatively small department, so one has to wear a lot of hats. I do teach composition, theory, and trumpet courses, and most often orchestration and counterpoint as well. BD: Is composition something that can be taught, or must it really be innate with each student? JG: [Laughs] There have been so many distinguished composers voicing themselves on opposite sides of this question, so I hesitate to give an authoritative answer, or any answer. BD: [With a gentle nudge] What is your opinion then? JG: My feeling is that it can be taught within the constraints of the students’ abilities. That’s the key word. There are certain procedures, techniques, approaches that students can be shown which sometimes can help the processes. But as far as getting beyond a certain level of inspiration, it’s every person, him or herself. BD: How long have you been teaching? JG: I’ve been teaching at Wooster for eleven years, and I held a Graduate Assistantship at Cornell for four years. Before that I taught at public school for two years, so I’ve been pretty much life-sentenced, as it were! [Both laugh] Actually I like it very much. I enjoy interacting with young and inquisitive minds, which at the very best of the teaching end of the spectrum the situation can provide. BD: Do they stimulate you? JG: Often that can be the case. They can ask very basic kinds of questions of the sort that I had put to rest a long time ago... or thought I had, which makes me rethink my premises and basic values on occasion. Also just seeing students have their own struggles can be helpful in reacquiring insights that we’ve all struggled through on our own levels. In that sense it can be very, very useful. Then when I teach in other areas I find it’s good for me to get my head outside of composing. BD: Have the students changed any in fifteen years? JG: The kind of teaching that I’ve been doing hasn’t been constant in fifteen years, so perhaps it’s difficult for me to answer that adequately. Based on the students that I’ve seen and to the extent that I can answer it, no I don’t think that there’s been too much change. BD: Do you see the influence on college or students of records, cassettes, videos, electronic media, etc.? JG: To the extent that students are aware of what we call concert or serious music at all, it’s only through such media. Few of them have been to many, if any, concerts of symphony orchestras, and their awareness seems to be raised to the degree that it is usually through records, tapes, and perhaps even films. In some cases they have an involvement with classical music programs, so in that sense we can be grateful for the influence of these electronic media. There are many students who believe that music is rock music, and that there is nothing that came before that or needs to come after it. They feel the world begins and ends with rock, so in many cases those who are comfortable with those beliefs and who do not plan to major in music probably retain those comfortably and are not disabused of them. But occasionally we find a music major coming in with rather a stilted view of what constitutes the history of music. BD: So why then do they want to get into a curriculum which will be orientated towards the serious music field? JG: They feel there is something out there that they’re missing, and whether they expect to like it or not, they want to taste a bit for themselves. I think that’s a very healthy attitude, so curiosity has a lot to do with it, honest intellectual curiosity in many cases. They also have the sense that there is something about the nuts and bolts of music. The mechanics of music theory and becoming a more literate musician appeals to them, so they sometimes subject themselves to the fairly rigorous courses of theory just to learn more about the innards of music and what makes it tick. Once they get exposed to it some are seduced by it, and of course there are others who are turned off by it as well. One can never predict! BD: When you’re writing a piece of music, do you gear it towards the people that you’re writing it for? JG: In my own particular case, almost always, yes. I enjoy being able to take on a commission and know for whom I am writing and know what they have in mind, and be able to tailor the piece to those kinds of constraints or dimensions. It’s interesting that you bring that up because as we speak I’m working on a commission for quartet — piano, violin, cello and French horn — which is a rather odd combination. The name of the group is the Heritage Chamber Players. Their headquarters are in South Carolina, and they’ve been commissioning various composers to write occasional pieces for this instrumentation simply because they’ve got very little repertoire. The reason I bring all of this up is because for the first time in recent memory they gave me complete carte-blanche as to the style, the dimension, almost anything. BD: They specified just the instrumentation? BD: Is there not an assumption on their part that they’ve come to you because they know what you do and they want something in that general area? JG: You’re probably right, but I, for one, feel a little bit more secure when those constraints are spelled out, so that I have some idea for whom I’m writing and what they had in mind. I took them pretty much at their word and wrote a rather serious and, in some respects, cerebral piece compared to some of my other things which tend to be more Gebrauchsmusik [utility music]. So I hope they’re not too disappointed, but they said I could have carte-blanche, so I did take them at their word! BD: What do you expect from the audience that comes to hear a piece of your music? JG: Very interesting question! Most people in my experience — even those who believe themselves to be versed in concert music — are not all that acquainted with, or even fond of, what we would call contemporary music or twentieth-century music. In the rather unkind words of Varèse, most of them appear to prefer to listen with their memories rather than their ears. As a result, people like to hear music which is essentially tune-orientated and accessible and within their context of experience; something they can make sense of on first hearing. It’s difficult to write art music which is probing and intellectual and also has to be tuneful as well. So given that they can’t have it today , many people have found it convenient simply to turn-off new music entirely. What do I expect of them? In many cases I expect people not to like my music the first time through, even though I am very much a derrière-garde composer compared to most. BD: But you have made a success out of that style, even though it is not on the cutting edge! JG: Yes. I’ve been more fortunate in that respect than many others have been. But even so, even with my derrière-garde traditionalism, and being headquartered where I am in the mid-West, folks haven’t heard a lot of new music, and in some cases people feel that avant-garde music begins where Vaughan Williams leaves off. BD: Do you kind of feel that you’re picking up where Vaughan Williams left off? JG: In one sense it would be an honor, but on the other hand I hope I’ve done some things that pick up on certain traditions that have been drawn since then as well. I really like a lot of new music. I like a wide spectrum and feel that I’m fairly catholic in my taste. As a listener I like to listen to a really wide variety of new music. On the other hand, as a composer, for reasons that are difficult to explain, I started out as a traditionalist, a conservative, and I seem to gravitate to very tonal and traditional kinds of sounds. I was very much influenced by Hindemith early on, and Bartók and Stravinsky and a lot of those sounds. A lot of the traditional forms are very evident in much of what I’ve done, and no matter how much I try to grow away from that, I seem to keep coming back to it. I had trouble making my peace with that, but as Socrates admonished, I guess I have to learn to know myself, and be who I am and be content with that. BD: If someone comes to you with a commission and says they want an Elliott Carter-type piece, would you turn them down? JG: Probably, yes. I’m not Elliott Carter, and he can do what he does so much better than I can... probably more expensively, to be sure. BD: Maybe they would feel they could get a cheap Elliott Carter piece from you! JG: That’s true in both senses of the term, yes! [Both have a huge laugh] No, in that case they’d be better off going to someone else. BD: Well, how do you decide? When you get a commission, how do you decide whether you’ll accept it or postpone it or even turn it down? JG: There haven’t been too many I’ve turned down. Usually people come to me because they’ve heard something of mine that they’ve liked, and they want something along similar lines. Usually I can live with that. Recently I’ve been trying to put more adventurous things in my pieces because as a listener I find many of the innovations, many of the sounds that composers have been using for the last twenty years to be very seductive and interesting. I’d like to find a way to integrate that into my own style without losing whatever may be essential about that style in itself. For me that has been a very long and difficult struggle, but if I can integrate enough things in a suitably eclectic manner, then maybe I can have the best of both worlds. I’m struggling to achieve that, and I hope I can continue to incorporate some new sounds into my pieces. BD: In your music, where is the balance between an artistic achievement and an entertainment value? JG: Again a very probing question. The scale in most of the pieces I’ve written comes down on the entertainment side, and I have enjoyed writing those sorts of pieces. I like music that people will enjoy. I tend to be fundamentally a traditionalist at heart, but as I get older I find that those sounds are satisfying me a little bit less each time out. There is a danger, of course, of writing the same kind of piece over and over again, and that, of course, can be deadly, and ultimately that will be no fun. It’s fun in the sense that it comes more easily because the materials are all well-worked, and one gets better at one’s craft, I hope. But there’s in me right now a greater curiosity to explore the kinds of sounds that I have not done so far; the kinds of sounds I like to listen to but have not incorporated so much in my own work. So I hope that for the next twenty years or so, if I’m able to continue writing, that there will be a deepening, and that the scale will start to tip more towards the side of artistic satisfaction as well as entertainment value. BD: Let me ask the great big philosophical question then. What is the purpose of music in society? JG: Again it would be a presumption for me to answer that when so many others have tried and succeeded in answering perhaps only for themselves. So if I may only answer for myself, I will do that. I like to believe that all the arts can and perhaps ought to have a kind of normative value to show life not necessarily the way it is — although that is a very wonderful function of art — but perhaps even more importantly, life as it could be and ought to be. For me music speaks a certain amount of optimism in the human condition that, despite all the horrors that we’ve witnessed in the twentieth-century which are very real and very heinous, and which need to be noted. Nevertheless, the human condition is such that we can continue to strive after a betterment of that condition with more affirmation, more benevolence, more humanitarian goodness, and I would like to see music capture some of that. I would like to see a positive affirmative sense of life in the music I write, and I guess it’s partly that which has led me to be more of a traditionalist. There’s a sense of aura and straightforwardness that, even though it sometimes comes short for my own taste on the imaginative side of the spectrum, nevertheless speaks of the world where values are achieved and the pursuit of happiness is not completely over and done with. BD: Is music at all political — your music, or music in general? JG: My music in any specific way is certainly not, but music itself certainly can be. There are composers, such as Henze and Berio and many others, who certainly show that this is something they value, and in our own country, Fred Rzewski has certainly had political motifs in his music. Ned Rorem argues that music is often great in inverse proportion to its philosophical and political content, and I’m not sure that he is entirely wrong. But for me, the artistic content comes first, and any political inclinations or intimations that may come afterwards are not necessarily of prime importance as I see it. BD: When you sit down to write a piece, are you always in control of that pencil, or are there times when that pencil is controlling you? BD: Are you surprised where it leads you? JG: Often, but that’s part of the fun of writing as well. In my own case, I have a very strong censor and I have to learn to control that as much as the pencil itself. Part of the fun can be when piece does lead you to unexpected directions, and learning how not to censor that is a very important part of the process. That’s something that I’m much better at telling my students to avoid than I am able to succeed in doing on my own. BD: Do as I say, not as I do! JG: That’s right, that’s right! I’m afraid that’s true. But often a piece does lead you on unexpected directions, and often when I’m able to go with the sense of imaginative flow, as it were, I do find that is when I can have the most fun. When I tend to censor too much and try to be too much in control, that’s when pieces tend to get most traditional and least imaginative, and go stodgy. So I have to go against that a great deal. BD: Do you work on one piece at a time, or more than one? JG: I like it best when I can work on one, but I’m working on two right now. I’m working on the Quartet that I mentioned earlier, and I’m working on a commission for the Cornell Wind Ensemble. It’s a piece which is a memorial to a composer who taught for ten years at Syracuse University, Brian Israel. He was a very fine and wonderful composer who tragically died of leukemia at the age of thirty-five. He wrote eighty-seven pieces that I’m aware of, many of which are really quite wonderful. He had a very close association with the Cornell Wind Ensemble for many years. Brian and I in fact were graduate students together at Cornell for four years from 1971 to 1975, so Marice Stith, the director of the Cornell Wind Ensemble, commissioned me to do a piece which is a memorial to Brian, and I’m at work on that in addition to the quartet piece. So that tends to be not typical for me. BD: While you are writing it, are you aware of the amount of time a piece will take to perform? JG: I almost always underestimate the amount of time. I compose very slowly, and that sometimes skews my judgment. I find pieces that I estimate will take eight minutes will inevitably take twelve or fourteen. I usually try to time my pieces as I go along so I have some sense of the dimensions, but I perennially underestimate. I’m not really sure why that is, although I seem to share that with colleagues of mine who tell me they do the same thing. The piece that I’m doing for the quartet I originally planned on being about twelve-minutes, and it looks like it’s going to come in at about eighteen right now. It’s still growing in the process of editing and hammering out the dents. Inevitably one makes additions and changes, and I don’t know if it’s a kind of ego mania, but very rarely do we do as much cutting as we ought to perhaps. Adding things is so wonderful that we can’t refrain from editing more as we go along. BD: How do you decide if a certain passage will stay or wind up on the floor? JG: It’s often safer to cut more than to add, but I end up doing more of the other. In the process of cutting, often I find that it leaves a bit of a jagged link. So I end up putting something else in, and often that something else tends to be longer instead. I try to play it through, then I put it down for while and come back to it many times, and think of how satisfying it would be if I were a performer doing the piece. If it doesn’t pass muster, then it just has to go. I’ve told my students — and I’ve tried remember myself when I’m composing — that even if it’s the most wonderful passage in the world, if it doesn’t seem right for the piece as a whole, if it doesn’t seem fully integrated or it doesn’t seem to really work in the overall context of the piece, it ought to go no matter how felicitous it is in itself. So I try to cut, based on the way it really fits into the overall framework of the piece. BD: Does it go onto the floor, or does it go into a notebook of sketches and unused portions? JG: Too much has gone onto the floor. I have a student who is now finishing a doctorate in composition at Cornell, who is wonderful because she finds a way to use everything that she writes. When she cuts something, she saves it for another piece. She hates to waste anything. I’ve been a little bit less successful at doing that. Perhaps they’ll come out in some later piece, but when the materials are often tailored thematically to a given piece, I find it’s difficult to use it later on. So it becomes wasted in many cases. BD: Does the germ stay in your mind and perhaps reappear in a little different guise? JG: I think so. Yes, sometimes that happens. I do have composer friends who are very good at tailoring a new piece so that the discarded bits fit elsewhere later on. Maybe I’ll try to follow their example, if I can! BD: Do you always have enough time to write the piece? Do you set it so the deadline’s far enough away that you know you will accomplish what you need to do? JG: Almost never. [Both laugh] I write very slowly, and I do find that my work tends to expand to ‘the available space’. In a sense I’m best when I have a very near deadline because it forces it me to be fast, and there are times when it forces me to cut corners. But on the other hand, I’d probably still be writing pieces that I wrote fifteen years ago if I hadn’t had deadlines. I work slowly but I’m trying to force myself to work a little bit faster with each piece, though it doesn’t come readily to me. I’m not really a very fluent worker. BD: Do you ever go back and revise a piece? JG: Always, or almost always. There are few pieces that I haven’t messed with in some way or other, and most of the pieces get revised and rewritten. I’m not always convinced that they subsequently are improved thereby, but at the time it seems they’re going that way. BD: At some point you’ve got to just put the pen down and say that it’s finished. How do you know when you’re arrived at that point? JG: I find that I’m always changing as a listener, so the way I listen to my own pieces changes across time. So it’s very difficult to find when that endpoint is. For me there is a time when I’ve been through it so often and it seems about right, it feels about as good as it going to get that I finally decide to bag it and that any more I do is going to be damage it rather than help it. So I try to leave it alone at that point. But even then, occasionally things will come up in performance. Especially if I conduct a work, which I sometimes do, I find that something will surface that I hadn’t planned on, and I’ll make a small change. But I usually get to a certain point where I try to leave it alone and not mess with it any longer. BD: I understand you are also a performer on trumpet? JG: For many years I was, yes, but in the last three or four years I have found it increasingly difficult to keep up with my performing. Trumpet requires a lot of diligent and regular application, and that has necessarily ruled out a lot of time for composing. It’s been difficult to find time to accommodate both, so my solution has been to play less and less. BD: Are you perhaps a better composer because you are a first rate trumpet player? JG: I don’t know if I was a first rate trumpet player. There’s a certain modicum of confidence that was there, so I like to say that I worked myself all the way up to mediocrity! [Both laugh] I would say I was an accomplished player, and it gave me a lot of insight into writing for instruments. Sitting in orchestras has helped me a lot. I like to think that when I write — especially for bands, which contain all the wind instruments that I feel I understand best — I feel that I gained a lot of insight in my years as a trumpet player. I’m not sure this has helped me a whole lot in writing for strings, with the bowings and what have you. I’ve gotten more there in the conducting experiences I have had. I worked long and hard at the piano, and even got even less accomplished than at the trumpet, but that work had helped. So I do think instrumental experience of some kind is useful to most composers, yes, and I don’t regret any of that. BD: Did you feel you were a better trumpet player because you were also a composer? JG: Yes, I think so. I tended to see a little bit more of the forest than the trees than sometimes seems to be the case with some players. But perhaps I only feel that way because that was my own peculiar perspective. It was great fun being able play in these ensembles. Trumpet playing is a very trying occupation in some respects, for orchestral trumpet players particularly, because there are vast quantities of time during which you are not playing, even though a piece is going on. It’s very common to rest for 76 measures, to come in on a high note and then put the horn back down on your lap again. So instead of day-dreaming, I found that it was a great deal of fun for me to bring the score of the piece along and listen to what else was going on, and see what the conductor was doing. Of course I missed one or two entrances during the course of my tattered career by being so absorbed in the score that I forgot what I was doing. BD: Give yourself a cue and forget to come in! JG: Again, I’m loathe to give advice to anyone because composition is a very, very difficult pursuit for anyone. We all have to find our own way. If I were to give advice, it would be that it’s good to find a few composers whose music you admire very much, and then study twenty-five hours a day. Get scores, listen all the time, listen to as much orchestra music as you can, and just learn to assimilate the sounds, the sound resources, and internally try and reproduce them to some degree. Ravel’s advice always struck me as being very wise. He said to find somebody you like and then imitate. If you have any talent, your talent will not manifest itself in the difference between your imitation and your model. If you don’t have any talent, it’s not going to matter anyway, so don’t worry about it! [Both laugh] That seems to me to be pretty sound. It’s good for young composers just to listen to lots of music and get that in their ears, and then just write, write, write! Write all the time! Listen to as much as you can, learn as much music as you can! Little by little it’ll come. BD: Do you write every day? JG: I try to. There are times when school is in full session it becomes very difficult. Grading finals and that sort of thing makes it hard. I find that when the machinery shuts down, it’s hard to get it going again, so in that sense, it’s in my own selfish interest to write every day. BD: Are there some days, though, when ideas just don’t come? JG: Yes, alas! Even then I try to force them to come. I think it was Tchaikovsky who said inspiration doesn’t come to the lazy, so I try to force it whenever I can. It helps me to think about composing very much as an occupation, as a job. I don’t have to be inspired to compose. In fact, I rarely think of inspiration. I don’t know if I even get inspired very much anymore. It’s a job and I do it. I have to do it every day. It’s what I do, and hopefully I’ve done it long enough that I can make something, and hopefully something interesting comes about most of the time. BD: But it’s not all technique, is it? JG: No, not at all. But after a while the craft begins to form what we call ‘inspiration’, for want of a better term, and the mutual influence of one on the other becomes harder and harder I think to trace. BD: You mentioned the grading of exams. Are these new compositions, or are these theory and harmony tests? BD: How can you grade a composition? JG: It’s very, very difficult. You need to know the students very, very well, and even then I feel timorous about it. I would be very timorous about grading my own compositions, although I’ve been a very severe self-critic, so it’s really the height of presumption to grade anyone else’s in that context. And yet, given the grading system that we have in academe, it’s doable. It creates a climate where a certain generosity of spirit is called for and is appropriate. The grading is more meaningful for me in a sense that it is constructive criticism. Letter grades I find kind of emptying and meaningless most of the time. If a student has done his or her best and seems to be working to the extent of his or her capacity and talent, it’s finding imaginative rather than ready-made solutions to problems. I try to help them to be growing beyond him or herself, and that’s really about as much as you can ask for. BD: So then you look for this creativity? JG: I think so, yes. BD: What else do you look for? JG: I like to see that there is evidence of growth from one composition to the next. I like to see that pieces not only use different combinations of instruments, but maybe expanding harmonic resources. A student, who has been a traditionalist might become involved with and absorbed by the prospects of proportional notation, for example, or notational techniques of other sorts. Students will try to work with different sorts of instruments in different ways and maybe try using formal procedures as structural organizing devices that they haven’t used before. All of those sorts of things can be indications that they are seeking imaginative solutions. On the other hand, it may be that an undergraduate with very little experience will be growing simply by gaining greater control over his or her materials, and learning to put together a large-scale piece in a way that it coheres reasonably professionally. I really do feel that instruction and grading has to be geared to each individual student. One of the programs that I’m very excited about, and that Wooster takes pride in, is the junior and senior thesis project. During the junior year, each composition major has to write either one fairly large-scale piece of about fifteen minutes duration, or several smaller-scale pieces. These are then performed and juried. During the senior year students have to do that for a full semester, and during the course of that project I’m able to see each student grows and help the student during the course of the works as I see them almost page by page. I do feel that we get to know each other fairly well during the course of that. BD: Is there any chance that we’re turning out too many young composers? JG: In one sense, probably, and in another sense it’s very hard to judge. It may be that the whole musical establishment, the Academy, might be turning out too many musicians. Certainly it is in too many because we can’t accommodate them all professionally, and they can’t earn a living at it. On the other hand, if people get honest satisfaction from doing something which is, in the very best sense, a positive and benevolent and constructive experience, then whether they earn a living at it or not is really their own business. If they know that with their eyes open going in, more power to them. BD: Should a composer make a living on his compositions? JG: If composers should, then most of us are in trouble. Very few do! It would be nice, ideally. The fact of the matter of course is that very few composers do, and you can probably name those by ticking off the fingers of one hand. Composers have to seek their satisfaction where they can get it. Composers know that they can’t earn a living composing, and it doesn’t stop many of them from becoming better during the course of their career. But on the other hand, it’s wonderful to be able to spend your career at what you love doing best, even if you can’t earn a living at it and you have to support it through various other means such as teaching. It’s wonderful to be able to spend your career doing something that you really have a passion for something which I think is essentially constructive, humanitarian and benevolent. It may sound a little Pollyanna-ish, but I think it’s true. We’re not really doing something which is overtly destructive and is going to hurt anyone. We’re doing something, which genuinely excites us intellectually, and it is very wonderful if we can earn a living just doing that alone. That’s perhaps not as large a price to pay as some other people in other professions pay all the time. BD: Do you feel it is better for a composer to earn his living by teaching music or playing the piano, rather than hashing fries or driving a cab? JG: I’d be the last person to prescribe what other composers should do. For me teaching works very conveniently. I like the interplay, the interaction with young minds, with unjaded young folks. I find that very exciting. For someone else who does not enjoy it, however they choose to earn a living is fine. When I was on my last leave from The College of Wooster, I met a fine Chicago composer called Sydney Friedman. I don’t know what Sid is doing right now, but I was very taken with his work, and I was amused and delighted that at that time he was earning his living as a nightclub magician! That was a new one on me for composers, but it seems to work very well for him, and he’s a very talented and able composer. Whatever works is fine! BD: Are you conscious of the audience when you’re writing a piece? JG: It depends on the given piece. The piece that I’m at work on right now I’ve deliberately tried to make more serious piece rather than a Gebrauchsmusik piece. I’ve decided to write this more or less for me, and to make it as interesting and satisfying as I can for my own sake. I’m writing a piece which is a commission for a college band or wind ensemble, and if the director specifically asks me to write a piece that he feels the members of the band will have fun playing and the audience will enjoy hearing, at least in the past I’ve enjoyed being able to fulfill a commission of that sort. You know, I played for many years in band. I got my start playing trumpet in a grade school band, and I remember what that’s like and rather feeling cynical about that. I really do feel that there is something quite wonderful about being able to reach beyond the players and provide music that they’ll enjoy playing. So often I do keep the audience in mind, sometimes I do not. BD: What are the joys and sorrows of writing for a wind ensemble or the concert band? JG: I have a love/hate relationship with the concert band. The orchestra is the medium which, as a listener, I love the best. It’s just an exquisite instrument, and has been for many years and probably will be for a long time. On the other hand, it was as a band player that I grew up, and it comes very readily and naturally to me. I enjoy writing for band because it’s a medium I know pretty well, and yet it’s very easy to write music which is maybe almost too easy and too accessible and too straightforward. I’ve fallen prey to that danger occasionally in the past, so the piece I’m working on right now for the Cornell Wind Ensemble I’ve tried to make perhaps a bit more adventurous and a little bit less Gebrauchsmusik oriented. One does have to guard against the danger of writing essentially entertainment music, and that is something which can come very easily. But frankly, it can be a heck of a lot of fun sometimes too. BD: If someone came to you and asked for six charts for a dance band, would you do that? JG: I don’t think I would do that. I used to do that when I was at high school and early college age, and it was fun. I love the ‘big band’ medium, but a dance band is something little bit different. It implies a little more of a commercial slant and it certainly can be done quite wonderfully, but if that were something I kept up with, my style would now be twenty years too old... although certainly there are many composers who find my concert music style perhaps even older than that! So maybe I’m not being fully consistent on this score. BD: It takes a lot of guts to just say that this is my music, and even though it’s conservative and tuneful, this is what I’m going to write. JG: When I’m being most honest with myself I find it sometimes difficult to be that way. I have to say that I honestly like tunes and I like functional harmonies and I like tonality, and no matter how I go, this says it’s who I am, and it would be far more honest to recognize that than try to be someone I am not. Now I must say very honestly that I get a great kick out of reading PG Wodehouse. I find him a supreme farceur, and he frankly makes me giggle and feel good about myself. But I often muse on what would have become of P.G. Wodehouse, wonderful farceur though he was, if he felt the need to become, say, a Tolstoy? I suspect he would not have been a very good Tolstoy, and we would not be reading his work. Meanwhile we would not have this legacy of wonderful P.G. Wodehouse. So it’s probably important for me to recognize who I am and be content with that, and yet within those parameters and constraints nevertheless try to grow as honestly as I can. BD: [With a gentle nudge] Are you a musical P.G. Wodehouse? JG: [Laughs] No, no, I’m afraid I’m too straight-laced for that much humor to come out. I have some friends who tell me that they are very serious about writing humorous music, and they are quite good at it. But no, I write music which I hope, at its best, will at least communicate a benevolent sense of life and a positive, affirmative kind of spirit. Humor doesn’t seem to be there in an overt way for me, or at least in a natural way, but I hope that a certain sunniness and benevolence of spirit comes through. BD: Have you basically been pleased with the performances you’ve heard of your work over the years? JG: I really can’t complain. We would all like to hear the very best performance possible, but in order to expect that, it’s incumbent upon each of us to write the most professional and clear music we can. Given the kind of music that I’ve written, I’ve been very lucky with the performances that I’ve enjoyed. Yes, I’ve had some very fine performances. The Nashville Contemporary Brass Quintet, for example, which is comprised of members of the Nashville Symphony, has done a recording of my Toccata for Brass Quintet, and I was very, very pleased with that performance. The Clarion Wind Quintet, which is in residence at North Carolina School of the Arts, did syndicated broadcasts of my Variations for Wind Quintet which I was really delighted with. I’ve had some really fine orchestra performances not by top-level professional orchestras, but which I’ve been very grateful for, and I’ve had some wind ensemble performances I’ve been pleased with. Maybe some of my best performances have been of piano works. A wonderful Long Island area pianist named Lawrence Schubert once performed my Piano Sonata in Carnegie Recital Hall, and just played the spots off it. I was delighted at that. Inevitably there have been other pieces which I’ve wanted to hide my head between my legs and make a beeline for the exit. So it’s not been consistent, but I can’t complain. BD: Do you ever go up to a conductor and make suggestions? JG: Yes. I try to couch my words as politely as possible, and be certainly circumspect where that’s indicated. I feel that if a piece is well written it ought to be able to survive a variety of interpretations, so I try not to be too militant about that. But especially when conductors indicate that they’re amenable to suggestions, I feel very free about offering them. BD: Do the conductors or performers ever discover things in your scores that you didn’t know you’d hidden there? JG: Oh, very commonly that’s the case. That’s a moment of great delight, I must say, because we flatter ourselves that we know our pieces rather well after we’ve spent so much time with them. So when a performer is able to discover something which I find satisfying and which I had not been consciously aware of before, that can really be a delightful moment. BD: Let’s talk about some of your recordings. First, the two band pieces with Murice Stith conducting. JG: Marice Stith is the conductor of the Cornell Wind Ensemble, and has been since I believe 1966. He has been just a marvelous and advocating champion of new music for wind ensemble, and has requested or commissioned or performed any number of pieces which have not hitherto been performed before. The Cornell Wind Ensemble recording series, which he inaugurated, has been extant for a number of years now and currently numbers about forty discs. I knew him only vaguely when I was in graduate school at Cornell, and I am very grateful to him for taking an interest in my ensemble music and performing it and recording it. On some occasions he also invited me to guest conduct as well. I think he’s just done yeoman service with new music for wind ensemble, and with an ensemble which is fundamentally comprised of non-music majors because Cornell tends not to have a performance school per se. Cornell’s music program, which is very fine, particularly on the graduate level, seems to be concerned primarily with composers, theorists and musicologists. So the constituency of the Cornell Wind Ensemble is formed almost entirely of people from liberal arts backgrounds or engineering school backgrounds. They to be fairly far flung, and under the circumstances they do marvelously. BD: What are your two pieces which are on that record? JG: The first is called Mist-covered Mountain, and was a piece commissioned by The College of Wooster Scot Symphonic Band. Dr Stuart Ling was director of the Band from 1949 until 1984, and in 1982 he commissioned me to write a piece, which because of the Presbyterian heritage of the school, would reflect something of their Scottish ancestry. He asked me if I’d consider using a bagpipe tune to orient the piece around, and I must admit that this did not tickle me at first. The prospects did not seem overly encouraging, but he showed me some bagpiping tunes which I found very fascinating, one of which is entitled (in translation) The Mist-covered Mountain. It has a fascinating Sicilian-type rhythm in Dorian mode. The piece was played at President Kennedy’s funeral, apparently having been a favorite of his. So I decided to write a free-form fantasy rather than a set of variations in which fragments of the tune are broken down and dispersed during the course of the piece. The piece is in four basic sections. There’s a slow introduction in which little fragments of the theme are heard, and then gradually accelerates into a fast main section which is based on other fragments of the theme. Then there’s a middle section, which is somewhat more atmospheric in quality, in essence poly-harmonic aspects. Finally a much varied reprise of the fast section in a sort of grand peroration based on the tune in a coda. It’s a very straightforward theme. He’d asked me to write them something which would be a lot of fun when it was played, so this is something of Gebrauchsmusik sort of piece! BD: And the other one? JG: The other piece is called Diversions. It’s a three-movement piece, which was commissioned by the Cornell Wind Ensemble. This piece came about because Marice Stith had performed Mist-covered Mountain after the Wooster Band premièred it. He wanted a piece for his ensemble perhaps along similar lines, so I asked him if a three-movement suite would be satisfactory for his purposes, and he said that would be just fine. He indicated that he was expecting to do some pieces that would be rather adventurous and not all that accessible, so would I mind keeping it more straightforward. I told him I’d be delighted, so the first movement is basically a kind of fanfare and toccata-like overture that almost never stops. It’s in perpetual motion which just keeps rattling along, featuring the fanfare motives especially in the brass. The second movement is rather sparser in its instrumentation and is through-composed. The last movement is just intended to be fun to play, a rock-em, sock-em march that’s in a straightforward three-part form. That piece was completed in 1985, and premiered that same year by the Cornell Wind Ensemble under my direction. BD: Are you the ideal conductor of any of your works? JG: I sincerely doubt it! [Both laugh] In a way, I hope not. Conducting is great fun for me, but I don’t pretend to be as accomplished as I ought to be. It’s wonderful hearing a piece in one’s ears for many months — or in some cases even a year or more — and then to come up on the podium that first time, especially if someone else has done the dirty work of preparing the piece, and then to hear the piece in full living sound. That can really be a kick, but a real professional conductor I’m sure would find many more things in the pieces that he or she was able to bring out. BD: Let me ask you about the Clarion Quintet piece. JG: In 1976, the Clarion Quintet inaugurated a project which they called the American Music Project. I think at that time they planned on it being an annual event, and of course this coincided with the bi-centennial, so there were lots of celebrations of American music going on at the time. Mine was one of twenty-five or so in a nationwide competition that were selected. They taped each of the pieces and had a syndicated series of broadcasts on NPR. BD: How long is the piece? JG: Ten or ten and a half minutes. The performance is really more than I could have hoped for. They played beautifully, so I was really very pleased with that. JG: There are certainly times when it’s fun. I imagine it must be like lots of other jobs. There are times when it’s fun, and there are times when it’s your job and it is necessary to go and do it. Lately I’ve been struggling a bit more than I used to, simply because it’s been so comfortable for me to write Gebrauchsmusik. It’s been too comfortable, and I’ve been forcing myself to try and do other things. I’ve tried on the one hand to be very noble about taking risks and holding out to a desirable end. On the other hand there’s a danger of sacrificing whoever it is that I may be compositionally. So I’ve been in a little bit of a stylistic quandary lately, and it has sometimes been a little bit less fun. I hope it settles back into a bit more fun. On the other hand, I honestly don’t think it matters. Ideally, yes, it would nice if it’s fun, but it’s what I do and it’s who I am. Whether it’s fun or not, the bottom line is really whether I do it every day and am committed to it as honestly as I can be. It’s incumbent on me to do it as well as I can, whether I have fun or not. It would be nice, but it’s incidental to that. BD: Have you written anything for voice? JG: Yes, I’ve written a number of choral pieces. BD: Tell me about the joys and sorrows writing for the human voice! JG: I love writing for the voice. I think the voice is a wonderful instrument, and as a composer who is fundamentally a traditionalist and who loves melody, I find it very gratifying to write for the voice. It is also very instructive for me to learn by trial and error. My first several pieces I had to learn a little more about the subtleties of prosody, which was something I found hard as I was never well schooled in it. But I enjoy writing for the voice. I think the voice is a very beautiful instrument, a wonderful medium. I love writing for chorus, and I love writing songs as well. I’ve written a number of songs, and it has been great fun for me to write those. So I enjoy the medium quite a bit. BD: Are you ever going to write an opera? JG: I certainly don’t rule it out. There are lots and lots of notes in an opera! I would love to write one sometime. I love opera as a medium. I think it’s wonderful. While I mentioned before that the death of the symphony orchestra has been greatly and prematurely exaggerated, with opera I’m not always so sure. It seems very difficult to get contemporary opera mounted. There’s always the occasional exception, but there just does not seem to be either the market or the interest in contemporary opera. I do love opera so much that I would like to do one some time, yes. If the right libretto and right occasion and the right set of circumstances presented itself, it would be great fun. Unfortunately I have many friends who have written operas that in many cases are wonderful pieces, and they just lie on the shelf. That’s sometimes as much as two or three years out of their life that’s just dormant, and that aspect of it I don’t look forward to. BD: So you want your music to be played? JG: Yes, I would. I really see no virtue in having music sit on the shelf, or being played after I die. I hope it is played eventually, but it would be much more gratifying to me if it’s played when I can still enjoy the fact that it’s being played. BD: Tell me about your solo piano music. JG: I’ve written a fair amount of solo piano music. There’s a fairly full-length sonata which I think is rather difficult. In fact the player for whom it was written specifically requested that it be difficult, so if it has no other virtues it can at least claim that! It pretty much follows my credo, which is that if you can’t make it good, at least make it hard! It’s a three-movement piece of about eighteen minutes duration. I have also written a fairly difficult sonatina which is about eleven minutes longs, as well as a bunch of bagatelles for piano, some teaching pieces, nocturnes, few other shorter pieces. BD: Thank you for coming by! JG: Thank you for having me. It was great fun. This conversation was recorded in Chicago on August 6, 1988. Portions were broadcast on WNIB the following year, and again in 1997. Portions were also broadcast on WNUR in 2006 and 2014, and on Contemporary Classical Internet Radio in 2006 and 2013. This transcription was made in 2015, and posted on this website at that time. My thanks to British soprano Una Barry for her help in preparing this website presentation.